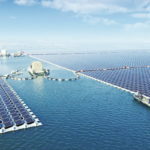 China has announced that the largest floating photovoltaic facility on earth has finally been completed and connected to the local power grid. Long reviled for its carbon emission record, this is the Chinese government’s latest achievement in its ongoing effort to lead the world in renewable energy adoption. Located in the city of Huainan in the Anhui province, the 40-megawatt facility was created by PV inverter manufacturer Sungrow Power Supply Co. The floating grid itself was constructed over a flooded former coal-mining region. Floating solar farms are becoming increasingly popular around the world because their unique design addresses multiple efficiency and city planning issue. They free up land in more populated areas and also reduce water evaporation. The cooler air at the surface also helps to minimize the risk of solar cell performance atrophy, which is often related to long-term exposure to warmer temperatures. This is just the first of many solar energy operations popping up around China. In 2016, the country unveiled a similar 20MW floating facility in the same area. China is also home to the Longyangxia Dam Solar Park, a massive 10-square-mile, land-based facility, touted as the largest solar power plant on earth. This transition to solar is in large part due to the rapidly plummeting cost of the technology itself. By 2020, China could reduce prices offered to PV developers by more than a third with solar power plans projected to rival coal facilities within a decade. The nation has also announced plans to increase its use of non-fissile fuel energy sources by 20 percent. An annual report released by NASA and NOAA determine that 2016 was the warmest year on record globally, marking the third year in a row in which a new record was set for global average surface temperatures. That said, if we as species hope to reverse this dire trend, initiatives like this and others will need to be adopted around the globe.